The blog officially turned 8 this August! Still on a high after attending the first ever Indian Food bloggers meet, I almost forgot that it’s been 8 long years since the Food blogging bug first bit me! I can still vividly remember the day, long long ago when I discovered this wonderland through the gorgeous Mahanandi. 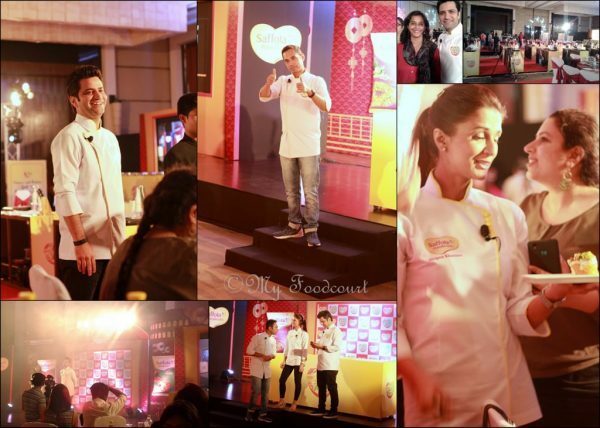 This gastronomic journey, more than anything else, has been such a precious learning experience for me. On my way I have also discovered my passion for baking and a whole new world of Food photography. 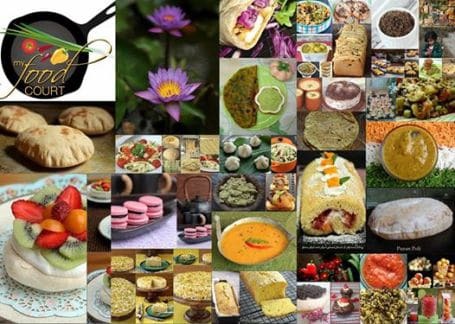 Reading, learning and imbibing everything shared by all the talented, generous and ever encouraging Food bloggers has enriched my culinary life and opened up many new avenues for me. So a big Thank you to all my Food blogger friends, for being so inspirational and encouraging throughout this ride. A huge THANK YOU to all the readers of My Foodcourt. To those who have stuck around for a long long time- posts or no posts. 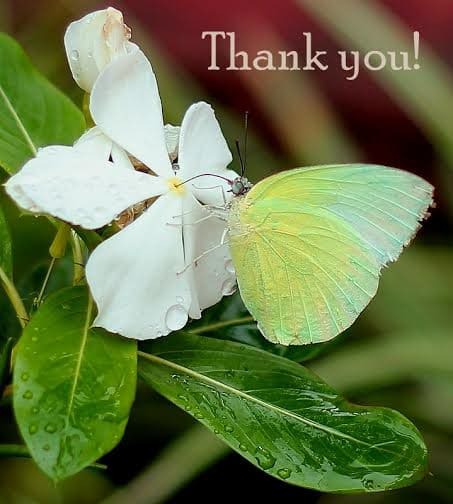 Thank you to all the new readers and to those whose comments & message are ever so encouraging. To those who check on me when the blog is silent for long- everyone Thank you very much. And now to today’s Soulfull post. 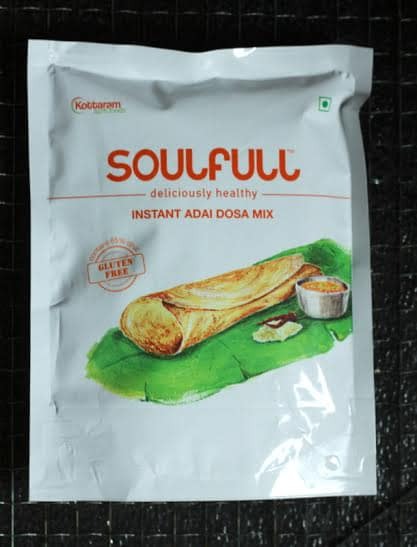 Of the cart load of Goodies we received at the #IFBM2014, the one from Soulfull was tried, tasted and over as soon as I returned back. I had heard great reviews about Soulfull from Food blogger friends, mostly on Twitter. This got attested when the fussy daughter finished the SoulfullChoco fills-Nagli bites without any fuss and was asking for more. I immediately checked with them if they deliver products in Nasik and to my delight they do! The son loved the Granola bars and I did not get even a glimpse of the bars. The Adai mix packet at the outset did not receive such a warm response. The fussy one declared- not another dosa. I promised her, no dosa. Both kids love Appe – dosa + veggies in a cuter Avatar. The Appe pan/ Aebleskiver pan is currently my favourite pan to use. The kids love their ‘Pancake appe’ made with the Appe pan. 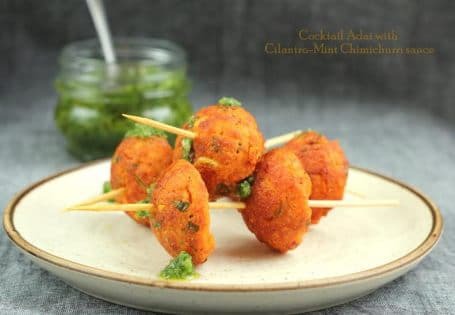 The Adai mix, instead of being served as a plain old dosa was dressed up with some veggies and served as cute little cocktail bites. 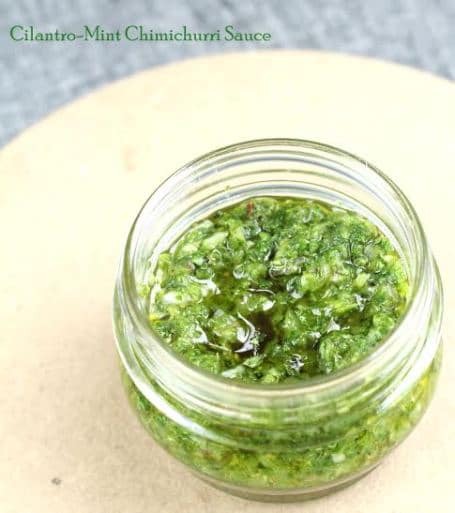 I made an Indian version of the Chimichurri sauce- a Cilantro mint Chimichurri sauce, which was relished with the Veg Adai Appe. From no more Dosa to more ‘Cocktail Adai Appe’ pls,the Soulfull Adai mix was a hit with the kids. I particularly liked the predominant flavor of Asafoetida in theAdai mix. 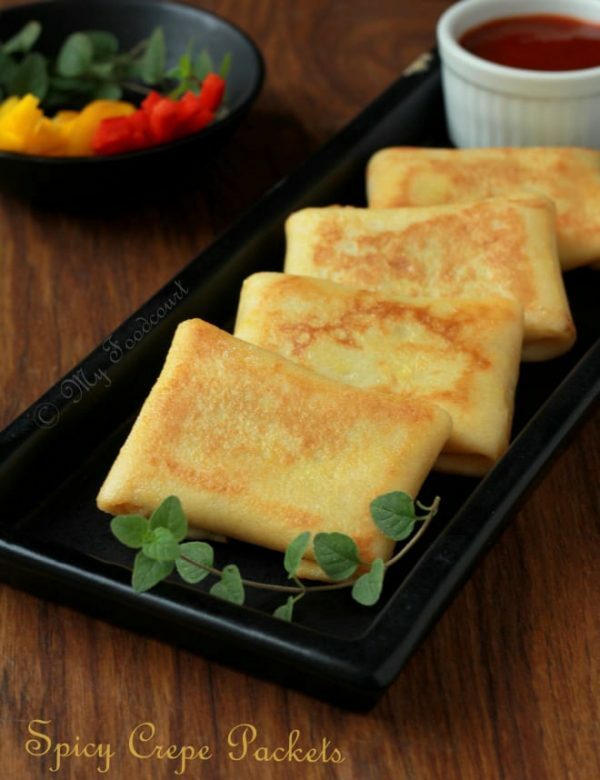 Mix the Adai mix,Rava, buttermilk and water and keep aside for half an hour. Drizzle oil in the cavities. Drop spoonful of the batter in the Cavities. Cover and cook on low flame for 3-4 minutes or till the bottom is golden brown. Use a wooden skewer to turn each Appe and cook on the other side for 1-2 minutes. Pulse together the onion, garlic in the blender/food processor. Take out the mixture in a bowl and add the rest of the ingredients and mix. Refrigerate if not using immediately. Happy anniversary to the blog and you, Madhuli! and what a way to celebrate just after the high from IFBM. Wishing you many more such and looking forward to your lipsmacking creations. 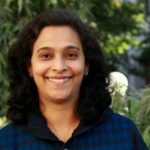 Hearty Congratulations Madhuli on your 8th blog-o-anniversary! Mahanandi is one of my favorite blogs too who inspired me to start on my own. I spoke to her once on phone and what a lovely, down to earth lady she is. Here’s wishing you lots of delicious and fun times ahead!. Thank you Siri for you warm wishes. Agree with you, I met her on my trip to Sugarland in 2011.She is so warm and generous and I felt I had met a long lost friend!